YouthBuild DC PCS is special because we not only support students on the path to earning their GED, but also towards gaining a meaningful career after they leave the halls of YBPCS. YBPCS focuses on the high-demand construction field, providing hands-on training to students to earn essential industry certifications such as OSHA and HBI. In addition to advancing our students’ career development, our construction projects help low-income DC residents rebuild their homes that they may of otherwise not have been able to do without YBPCS’ help. Since December 2018, students have been working on an apartment on Park Road in Washington, DC. This particular site is being completed in partnership with the Brothers of Charity, a nonprofit that focuses on education and providing care for children, adolescents, and adults. After the site is complete, it will be used as transitional housing for individuals in need within the DC community. As of now, students are working hard to caulk walls, reinforce windows, and paint the walls and ceilings. YBPCS will be finished with this project late February 2019. Students and construction staff are excited to see the project on Park Road come together, and they recognize the importance of the work within the DC community. 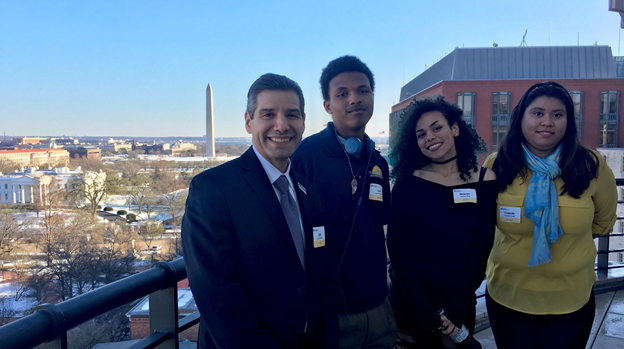 Construction Instructor John Bonner shared how impressed he is with the students’ work and how the YBPCS team has come together to make a difference within the DC community. Student Ivory Gigger participating in an adopted park cleanup. YBPCS’ AmeriCorps State and National program has started the year off in full swing! With the hiring of new Transitions Specialist, Kate Salasky, YBPCS has recruited many new members for the AmeriCorps State and National program. This AmeriCorps opportunity offers $1,290 in scholarship funds for college and/or vocational programs to students who participate in at least 300 hours of community service. Students serve their community not only through ongoing construction projects to renovate low-income housing, but also through programs to feed the homeless, clean-up local parks, and more. Ms. Salasky believes in the importance of fostering drive to serve the public in the next generation. She also believes that YBPCS’ AmeriCorps program is an amazing opportunity for all who are looking to pursue post-secondary education and to build their resumes for future job applications. With the help of Brittany North, YBPCS’ AmeriCorps VISTA, she plans to set up 3 to 4 monthly community service projects for YBPCS’ AmeriCorps members, such as the amazing opportunity to build a playground in DC partnering with the nonprofit Kaboom. YBPCS’ AmeriCorps State and National program helps our students stay connected to their community as well as earn funds for a brighter future. By the end of 2018, YBPCS will have almost 40 AmeriCorps members. YouthBuild students and staff partaking in an adopted park cleanup. Starting in the summer of 2017, YBPCS partnered with the National Park Service and adopted the James Cardinal Gibbons Park across the street from campus! YBPCS’ adopted park is a part of Rock Creek National Park, one of the largest national parks in the city. Every two weeks, YBPCS staff and students serve their community by participating in an adopted park cleanup. During these park cleanups, students and staff can be seen raking leaves, picking up trash, and pulling weeds. Community members are also welcome to these community service projects! YBPCS believes that community service is extremely important to our students’ personal development as it creates a sense of ownership and belonging in their community. If you would like more information on YBPCS’ next adopted park cleanup, contact YBPCS’ AmeriCorps VISTA at 202-567-2474. “It only took that one ‘yes’", Yolanda Torres told the power players assembled in the conference room on the top floor of an office building overlooking Lafayette Square and the White House. Yolanda was advocating for her alma mater, YouthBuild PCS, at a fundraiser for Youthbuild USA. “I needed a second chance to get my education. I needed a chance to make a better life for myself and my family. I needed the opportunity. It only took that one ‘yes,’ and YouthBuild PCS was that ‘yes.'" Yolanda was one of twelve GED grads in the Spring of 2016. After graduation, Yolanda continued to serve YouthBuild PCS as an Americorps VISTA and as a member of its board of trustees. In the Spring of 2017, YouthBuild PCS was proud to congratulate seventeen GED graduates, and Yolanda had the privilege of presenting the graduates with their GED diplomas. When her VISTA year concluded, Yolanda Torres went to work for Catholic Charities, where she currently serves as an administrative assistant in the Homeless and Housing Services Division. This year, YouthBuild PCS was rated a top-performing Tier 1 school on the 2017 School Quality Report. A Student Finds Success at YouthBuild PCS. (2017, November 30). DC Public Charter Schools Now.